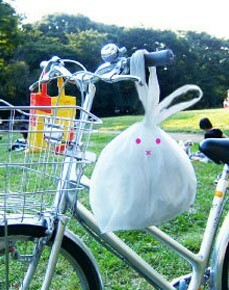 Meet Rabbit-kun, a plastic trash sack with pink eyes, an X-shaped mouth, and a pair of bunny ears that double as handles. 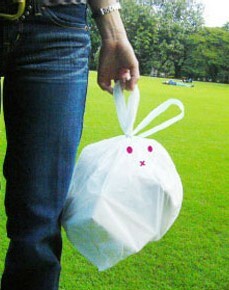 Designed by Tokyo-based creative group MAQ, Inc., Rabbit-kun aims to inspire a more responsible attitude toward waste by providing a cute and stylish way for people to carry their trash home after a day outdoors. Whether it's a picnic in the park, a hike in the mountains, or a day at the beach -- or any place without public trash cans -- Rabbit-kun is charming enough that you might actually enjoy carting your garbage all the way home. 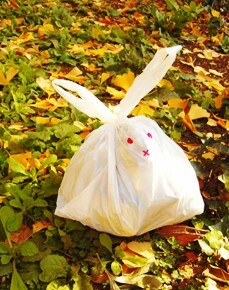 The bunny-shaped sack is the latest in a line of eye-pleasing Garbage Bag Art Work trash bags by MAQ. Their previous creations include a series of color-coded bags imprinted with patterns of trees, fish and flowers, which are designed to add convenience and character to neighborhood garbage collection points. 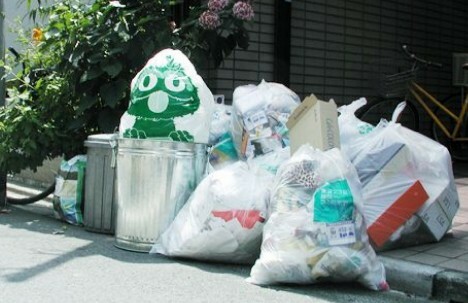 Another bag, which features a life-sized illustration (by Lily Franky) of trash-loving Oscar the Grouch, was designed in collaboration with Sesame Street as part of an environmental awareness campaign for children. For now, these bags are being distributed free of charge at select outdoor events, as well as to volunteer cleanup groups and schools. 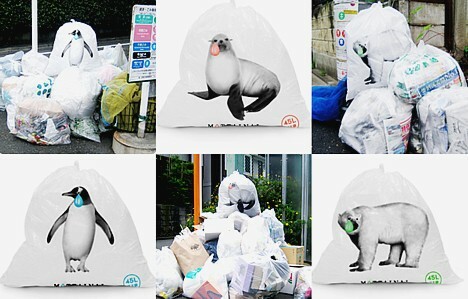 And for animal lovers, MAQ offers the Mottainai series of bags featuring images of teary-eyed penguins, seals and polar bears, which turn the neighborhood trash heap into a friendly reminder of the fragility of our planet. A portion of the profits go to the Green Belt Movement (a grassroots environmental NGO established by Kenyan political activist, environmentalist and 2004 Nobel Peace Prize winner Wangari Maathai), which has planted millions of trees across Kenya to prevent soil erosion. 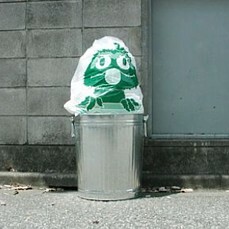 Garbage Bag Art Work trash bags are available at various locations in Tokyo or at the Mottainai online shop (Japanese). Aren't these just more petroleum based bags? It makes little to no sense. You know what? I live in America. I wish they seriously had these there, because I'd really enjoy them. I'm not kidding. I already pretend that when I put trash in my tash can I'm feeding it. This would really add to it. 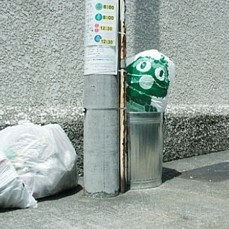 This is awesome - a simple yet effective way to make garbage fun(?). I second that motion, Provi - I say bring 'em on in the states, it might get a few more people interested in doing the right thing...and having a laugh while they're at it. Further proof that the Japanese will anthropomorphize ANYTHING. 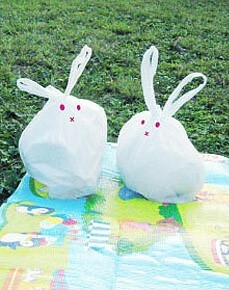 If I were an Asian wannabe, I'd be all, "KAWAII RABBIT SAMAAAA! ^_^" but I'm not, so I'll just say they're really cute and I want some. Its really cool. A nice way to divert ones attention from the dirty thrash. ?IT??? (UID) » Archive » ??????????????? ?